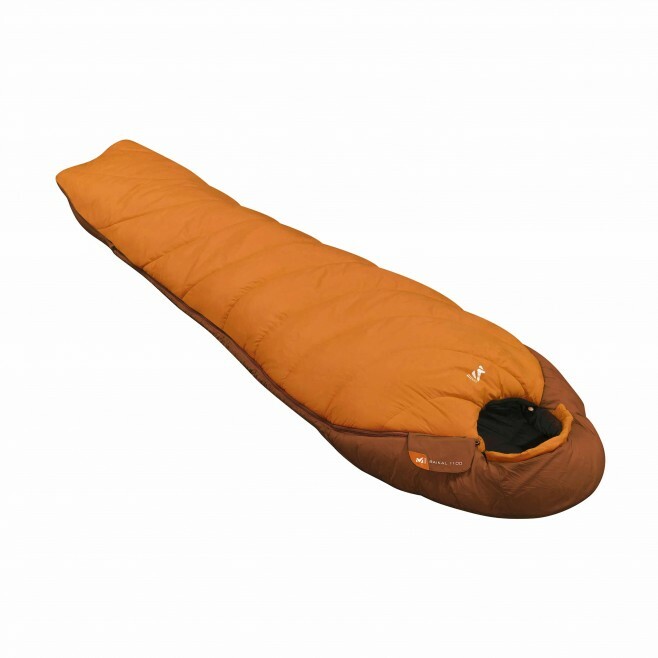 "A long version of the 1100 Reg, for taller users, this three-season synthetic-fill sleeping bag, designed for walking and trekking, manages wet conditions really well. Under canvas, you often have to deal with condensation explains Antoine, product manager. Moisture can come from the body, but it can also be very wet outside, when it snows or rains. There is ground moisture, too. Synthetic fill ensures a good reaction to all these types of moisture. Other advantages of synthetic fill: Affordability and ease of care: You can machine-wash a synthetic-fill bag and store it compressed. The Baikal range, available in six models tailored to you and your activities, lets you choose according to the comfort temperatures that suits you. Hood with drawcord Left or right hand zip, combinable FABRICS Fill : SuperMix Fiber 3D mix of hollow silicone-coated fibers Top: 2x100g/m. Bottom: 1x150g/m Outside shell: Polyamide 40D/255T ripstop Inside lining: 50D/300T Polyester COMPOSITION Outside shell : 100% polyamide Filling : 100% polyester Inner : 100% polyester WEIGHT Average weight: 1,220 kg / 2lbs 11oz "